It doesn’t get simpler than good old ham and cheese. All you need is five ingredients (more if you want to add the crisp bite of fresh homemade pico de gallo) and less than 30 mins in the kitchen. This hearty lunch is a fun twist on the classic Philly cheesesteak. It’s got all the requisite ingredients: steak, mozzarella cheese, grilled onions and peppers. But add flour tortillas and creamy avocado, and you’ve got something special. Cheese on the outside?? We know… minds have been blown all over the universe. But we know your kids (and the kid in all of us, really) will love this addition to their lunchtime quesadilla. The cheese, chipotle chicken and avocado filling help too. Quesadilla purists will argue that a true quesadilla must be made with corn tortillas. We’ve enjoyed enough flour tortilla versions to be happy either way, but if it must be corn, we’ll give you corn… and fill them with corn! We’ll even admit to how delicious they are. 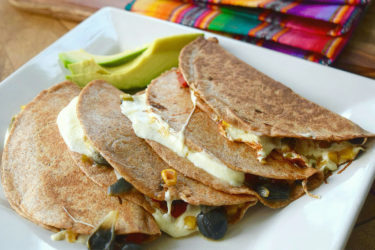 Ten ingredients and twenty minutes to scrumptiousness… that’s how we would describe these hearty quesadillas, which would do any lunchbox proud. There are two words in the English language that will make any weeknight cook smile: “lightning quick.” When you can escape the kitchen in 15 minutes and produce a tasty meal, you’re doing something right in the culinary world. The only flaw in this master plan is that you’ll need cutlery to avoid making an epic mess of the guacamole and pico de gallo topping. Mushrooms are one of our favorite meat substitutes, and in this quesadilla recipe they take center stage. Paired with onions, garlic, chile and cheese, they make for a pretty gourmet and healthy lunch option. Who says you can’t get fancy with a quesadilla? Actually, we don’t think anyone ever said that, but just in case they did, we disagree! This recipe includes two ingredients not typically found nestled in melted cheese and sandwiched between tortillas (for that matter, neither is Manchego cheese, but we’re not complaining). Still, we have a feeling your family will love it. 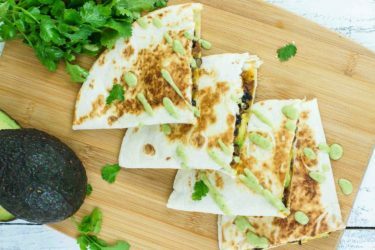 If you want to take your quesadillas to the next level (and keep it vegetarian), this recipe combines the robust flavor of roasted poblanos with refried beans and Monterey Jack cheese. It’s a delicious dish by itself, but if you want to elevate it to new gourmet heights, add the homemade avocado salsa verde. When it comes to school lunches, every parent knows the challenge is how to keep hot foods hot. Well, chef Sonia designed these quesadillas with that thought in mind. She wanted a dish that she could prepare ahead of time and would taste yummy at room temperature… in other words, the perfect dish for a lunchbox! 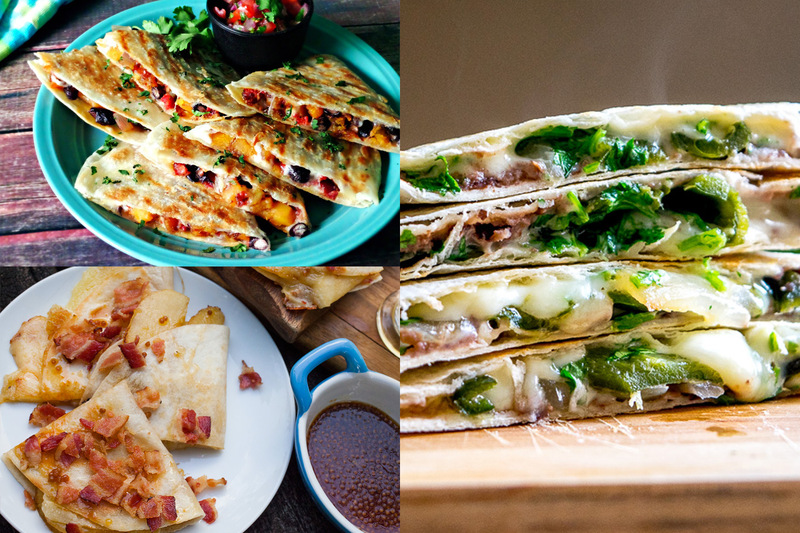 Ok this is the quesadilla equivalent of a gourmet sandwich… but it’ll take you only 15 minutes to make and requires only seven ingredients. 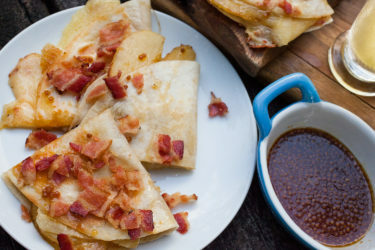 Plus, you can’t go wrong with the flavor combination of apple, cheese, and bacon. If your family likes breakfast for lunch, they’ll love this breakfast staple from chef Fernanda. With a simple but winning combination of cheddar, chicken and beans, this dish can be packed into a lunchbox or enjoyed any time of day.